A Life Insurance Retirement Plan, or LIRP, is a specially designed life insurance policy that does much more than just provide a death benefit. A LIRP is a permanent life insurance plan that simulates many of the tax-free traits of the Roth IRA. A properly funded LIRP can provide large, tax-free, streams of income during the policyholder’s retirement years. There is no income limit to a LIRP — unlike a Roth IRA, there are no earned income limits. This means high-income individuals can also participate in a LIRP strategy. In this article, we will take a broader look into how this plan works and see an example of how much tax-free income is possible. What is a LIRP, or Life Insurance Retirement Plan? A life insurance retirement plan, commonly referred to simply as a LIRP, is a type of permanent life insurance policy that builds cash value – some call it an overfunded life insurance policy. Unlike most other permanent life insurance policies, though, that are purchased for their death benefit protection, a LIRP is used more for its cash value and retirement income potential. The cash value can be accessed tax-free for the purpose of supplementing your retirement income. While whole life insurance policies can provide a viable framework for a LIRP, it is universal life insurance that can typically provide the best LIRP platform. Specifically and index universal life insurance policy. One reason for this is because universal life policies are more flexible than whole life insurance. See this article if you need to a refresher on the types of life policies. Although LIRPs can offer a source of tax-free retirement income, there are some potential drawbacks to consider as well, depending on your goals for the policy. In today’s market, you have many options available for saving for retirement. Some of these may provide tax advantages on the contributions, growth, and / or the distributions. But if you’ve already “maxed out” your IRA and / or other retirement plan contributions, you may be seeking additional tax-advantaged vehicles. That’s where life insurance comes in. By adding permanent life insurance, you can diversify your portfolio from a tax perspective. Life insurance can also provide you with flexibility and preferential tax treatment both now and in the future. Most people don’t think of funding retirement with a life insurance policy. But it can have its place. When held in certain types of accounts, such as traditional IRAs or qualified plans, tax is deferred on the growth and is paid at the time of withdrawal. Deferred annuities are also in the tax-deferred category. Allianz is currently offering a 15% premium bonus on any interest credits during the first year of the LIRP. They also offer some of the best-guaranteed loan rates during the withdrawal phase of a LIRP. This is the carrier who specializes in the child LIRP and will issue policies at a preferred rate on a child. This is a big deal. Ask why. AIG offers an Income for Life Rider that is a wonderful benefit and can guarantee the tax-free income for life. We like Nationwide’s IUL Accumulator as one of the best LIRPs available due to their bonus crediting method. Jim, who’s 40, is looking to save additional money for retirement. He purchases an Indexed Universal Life policy and pays $24,000 for 15 years, while he’s still working. The cash value grows tax-deferred for 26 years. If Jim retires at age 67 and chooses to start taking income a year later, he can potentially withdraw $135,114 a year for 23 years on a tax-free basis from the policy’s cash value. And he still has a death benefit in place to protect his family, should he die prematurely. In this example, Jim contributed $24,000 per year in premium for fifteen years, for a total amount of paid-in premium of $360,000. But starting at his age 67, Jim was able to access more than $135,000 per year – for the next 23 years – for a total tax-preferred income of nearly $1.9 million. At the same time, Jim’s loved ones were covered by a death benefit that, even after all of the income he accessed, was more than $770,000 when Jim turned age 90. The LIRP provided Jim and his family with a long-term, tax-free income stream. And, because life insurance policies are considered to be “self-completing” plans, his survivors continued to have a death benefit “safety net”…just in case. Are You a Good Candidate for a LIRP? LIRPs can be complicated products. Because of that, working with a life insurance specialist is recommended before you move forward with the purchase of a LIRP. In addition, an independent life insurance professional can go out into the market place and find the plan that works best for you and your specific goals. At Insurance Geek, we are affiliated with more than 30 of the top-rated life insurers in the industry. So, we will match you with a plan, and a premium, that fits with your budget. 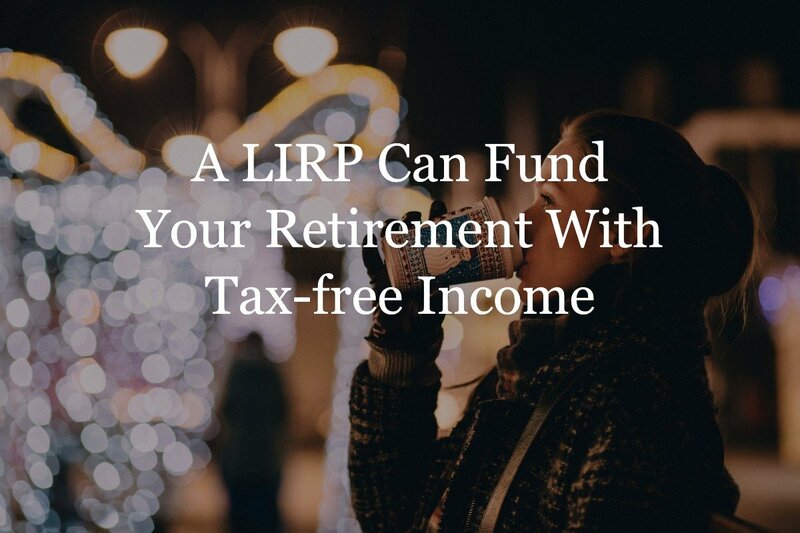 Contact us to get started with building your tax-free retirement income stream with a LIRP. A LIRP is one of the best gifts any parent or grandparent could ever give a child. See why I set up a LIRP for my kids, at the ages of 3 and 1. Kids can lock in their own LIRP, too. Because life insurance premiums are based in large part on age and health, children can be ideal candidates for LIRPs due to the low cost of insurance and, with so many years to let the policy’s cash value compound, a LIRP can set them up for a lifetime of financial security at an early age.